Once you have narrowed down your camp search it is great to delve a little deeper into the operations management of the organization. Be prepared to ask some specific questions about how the management ensures the safety of it’s campers and the reliability of it’s programs. How are the camps that you are interested in sticking to the rules and regulations that are in place to effectively ensure that the camp is safe and credible? Operating a seasonal summer camp isn’t just all swimming in the lake and s’mores around the campfire there are a number of agencies that govern how camps are managed particularly focusing on the health and safety of the children and staff. In Maine camps must be licensed through the State and there are a series of State laws that govern basic operations along with minimum standards required to get a license and operate as a youth camp. Safety should always come first. Camp Runoia girls are well prepared for their adventures. A camp may meet the basic State standards but then there are also best practices in the camping profession. 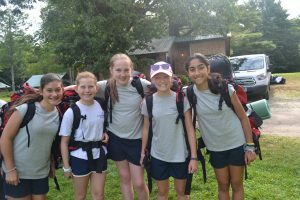 The American Camping Association is the national governing body for youth camping and it has it’s own established set of guidelines for ensuring consistent quality in the programs that it oversees. This ACA Accreditation has been a long tradition at Camp Runoia. Not only have we maintained our compliance since the 1960’s we also have many years of being visitors and experiencing the opportunity to check out other camp programs. This reciprocal peer process is a great learning opportunity for both parties and allows sharing of ideas and best practices from a wide variety of programs. Our programs are designed around the ACA standards of best practice and we strive to operate above and beyond any minimal standards. Once you’ve narrowed down your camp search and checked out some great websites talking with the Camp Director initially by phone then ideally in person at a home visit or camp tour is next for getting your questions answered. This great Newsweek article helps define a little more why asking the right questions is important and the value of choosing a camp that has been accredited by the ACA. As always give us a call or shoot us an email if you want to chat more about camp for your child, we love helping families to find the best fit. Why choose sleep-away camp at Runoia?